Scene modes are pre-set exposure modes on beginner-level digital cameras that help inexperienced photographers achieve the proper automatic settings for a photo. Use of a scene mode doesn't allow the photographer to make any changes manually to the camera's settings, which may be frustrating for an advanced photographer. Scene modes are designed specifically for beginning photographers who don't want to take the time to change settings manually. By using a scene mode, the photographer is attempting to simplify the process of matching the camera's settings to the scene. Camera designers simplify the process of matching the scene to a keyword. If you're shooting outdoors in the winter, for example, you might want to make use of the snow scene mode, as shown in the screenshot here. The camera will then adjust the exposure to compensate for the bright white of the snow. You might select a sports scene mode to tell the camera to shoot with the fastest shutter speed possible to stop the action. You're basically telling the digital camera to emphasize a certain aspect of the scene for a particular set of upcoming photos, and then match the automatic settings to that aspect of the scene. Does My Camera Have Scene Modes? Some cameras contain a dozen or more scene modes, while others may only have five or six. The more scene modes that a camera offers, the more precisely you can match the scene to the camera's automatic settings. Typically an advanced camera, such as a DSLR camera, will not even offer scene modes, as the advanced photographers at whom the DSLR is aimed shouldn't need to make use of scene modes. However, you may find scene mode options on an entry-level DSLR camera or on a mirrorless interchangeable lens camera (ILC), both of which are models aimed at photographers who are looking to migrate from a fixed lens camera to a more advanced camera. Having scene modes available can help ease the transition from a beginner camera to an intermediate or advanced camera for those photographers. To find any scene modes on your camera, look for a mode dial on the top or back of the camera. This round dial should have a series of letter and icons printed on it. SCN will be short for scene modes on a mode dial. 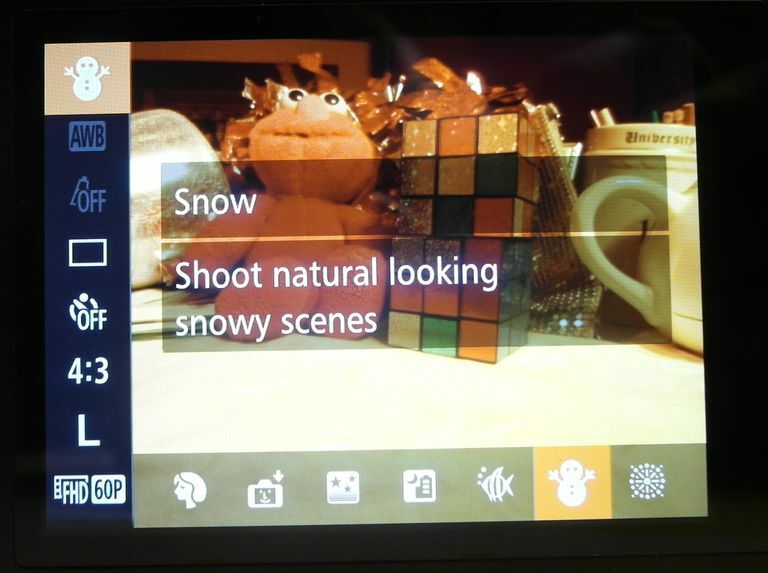 Turn the mode dial to SCN, and you should see a list of potential scene modes on the LCD screen of the camera, represented by icons. Then you'll just want to pick the icon that most closely matches the scene you're preparing to shoot.